It was another beautiful week here in the Northwoods, after getting through a ground soaking Saturday things were really pleasant, a muddy driveway is about the only thing you’ll catch me complaining about lately, and well, maybe the amount of Walleye that are making it to the frying pan. It’s not that Walleye fishing is bad, I would venture to say it’s actually pretty good, it’s the size of the fish being caught that is throwing a wrench into fish fry plans. On the big side of the lake where we’re located it’s always been an area where bigger fish tend to hang out, there are less weeds on this side of the lake and that is what really attracts the bait fish and in turn attracts fish of all sizes to the buffet line. Pictured below from L to R: Scott Carlson from Colorado with a 25.5 inch specimen, Don Rogers from Fort Dodge, IA with a unique vertical hold on a nice slot fish, Jonah Rogers from Ankeny, IA with a hefty Northern Pike, and finally Grandma Dorothy Rogers with a welcome back to Leech present for her first trip out – 40 inches of Muskie. The main lake is mostly rocks and gravel with a peppering of sand making it ideal spawning habitat and in my opinion, especially in the spring through early June it’s the reason why you see many slot fish or “overs” being caught out here, it’s mostly the girls doing what they do and when they are done they are hungry. The west side of the lake has quite a bit of shallow water with abundant weed growth, that area always warms up first and is a popular area for panfish spawning. Getting into a pile of black Crappies and Bluegills is about as much fun as a guy can handle. Walleye fishing at the moment is shifting towards the reefs and mid-lake structure, with leeches and crawlers tied to a lindy rig being the best bait, as water temps continue to increase the crankbait trolling bite will soon become the favored method. Right now I would head south for the next couple weeks and fish the south shore structure from Roger’s Point to Bungy Bay, that area involves some finesse, since many of the humps and bumps are small, but there are many to choose from, watch your sonar and don’t spend too much time on any given spot, not marking fish, don’t hang around, many times being mobile is the key. Eli and his sister Zooey from Minneapolis, MN showing off a nice day on the water – Grandpa Jerry Sloniker from Graettinger, IA helping Eli hold his Walleye – another shot of Jerry this time with a beauty of his own. We’re a week deep into he Muskie season and are already hearing reports of active fish and fish being caught. Water temps are inching ever closer to the 70 degree mark and that typically is the sweet spot for Muskie activity, Muskie will be about everywhere in the summer months feeding and just acting goofy. Smaller fast-moving baits are often the bait of choice during the summer months, but don’t be afraid of throwing something larger. Back when I had more time to Muskie fish, I really liked using top water “chopper” style baits or “walk the dog” top water baits, they may not have the highest hooking percentage but seeing a Muskie come out of the water to hit your lure is a pretty awesome sight. 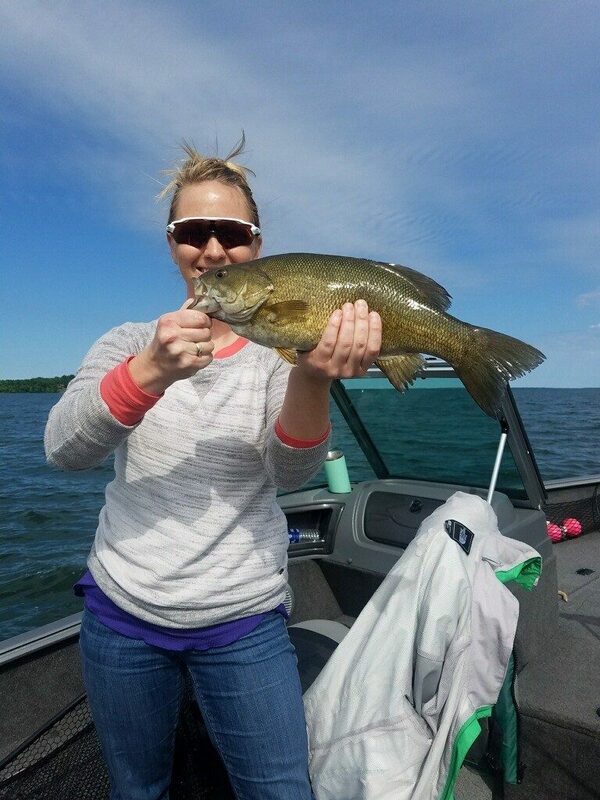 Bass fishing has recently opened for the season as well, Leech has never been known for its bass fishing but is quickly becoming a top-tier bass fishing destination. Large mouth populations have always been good here and the lake usually has a half-dozen or so tournaments throughout the year. Small mouths are really starting to show themselves, when I first started working on Leech over 20 years ago, you would be lucky to see a single smallie brought in, now we clean hundreds per year and from last week alone you see a couple of pictures in this blog showcase some absolutely huge smallmouth bass, and they fight like you would not believe. It’s really tough to decide what you want to fish for while you’re here. At least you won’t need to decide who’s going to clean the fish, we’ll do that for you. Summer is just getting started and we have some cabins available, come give us a try! if you have any questions don’t hesitate to call or drop me and email, I would love to hear from you!